Six years ago, Obama had a vision of a ‘new beginning’ for Islam and the West. But he retreated when hard realities shattered his Middle East fantasy. We have good reason to believe Generation Z will continue to populate the earth the old-fashioned way and reinforce the natural gender binary in the process. Why anyone expected a robot who learned on Twitter to become anything other than a Nazi is beyond me. 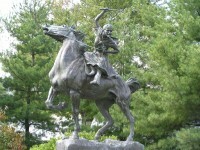 Listen my children and you will hear of the midnight ride of the female Paul Revere: Sybil Ludington Ogden. Two black San Francisco State University students accost a young white man for having dreadlocks. Pretending that Muslims, Methodists, and Mormons are equally likely to be inspired to violence by their faith is beyond indefensible. Donald Trump’s campaign manager Corey Lewandowski was been charged with misdemeanor battery today after allegedly grabbing and bruising a reporter. When your most loyal media supporter is saying you’re mental, it should send a message to any normal campaign that you ought to reconsider your course. States nationwide are beginning to join the ‘Fight for $15.’ My job experience in Seattle, Washington helps illustrate why that’s a bad idea. The time to stigmatize bouts with depression is over. Millions share Heidi Cruz’s story, and it doesn’t delegitimize her or her husband one bit. Join us in marveling at—and even seeking to emulate—the achievements of these female scientific pioneers. Donald Trump is the only candidate seeking to put America’s interests first, especially in the areas of trade, defense, and immigration.